This article originally appeared in the July 3, 2017 issue of SpaceNews magazine. On March 1, 2015, Boeing inaugurated the all-electric satellite with the launch of the ABS-3A and Eutelsat 115 West B geostationary spacecraft on a single SpaceX Falcon 9. Eight days later, the French space agency CNES committed $30 million to spark Europe’s all-electric propulsion efforts. The CNES investment was influenced by industry forecasts predicting 50 percent of commercial telecommunications satellites will be all-electric by 2020. 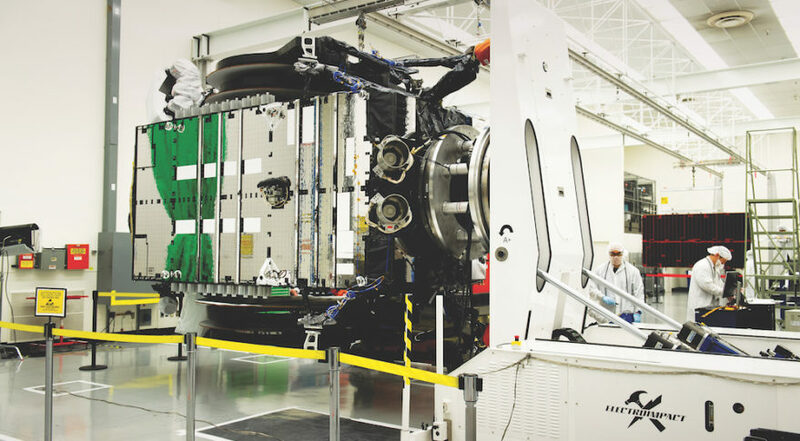 Boeing built the industry’s first all-electric satellites as part of a watershed four-satellite deal won in 2012 from satellite telecom operators ABS and Satmex (the latter is now part of Eutelsat). In the wake of that deal, companies and space agencies around the world upped their investments in electric propulsion with the expectation that the technology, which has been used for decades in science missions, was now about to go mainstream in the commercial sector. Two years later, the predictions on which CNES based its investments are so far right on track. According to Northern Sky Research Senior Analyst Carolyn Belle, operators ordered 26 electrically propelled satellites from 2012 to 2016 — 20 all-electric spacecraft, and six “hybrids” that will rely on chemical propellant for orbit raising. Belle said NSR tallied 106 satellites ordered over that four-year period, equating to roughly 25 percent of satellites using some form of electric propulsion. Satellite manufacturers are now trying to figure out how to maximize their share of the electric propulsion market while not abandoning more conservative customers. ArianeGroup’s orbital propulsion division, located in Lampoldshausen, Germany, became part of the Airbus-Safran joint venture when the company formed in 2015. Koecher said the propulsion company sold products to other satellite manufacturers globally before the joint venture formed, and continues to do so now, averaging 10 integrated propulsion system sales annually. Electric propulsion’s appeal is its ability to drastically lower a spacecraft’s wet mass, or the mass of the spacecraft and its propellant, because of the low-mass (and volume) of electric propellants. Compared to chemical propulsion, an all-electric satellite can weigh 50 percent less. Satellite operators can use that free space to pack more payloads on the spacecraft bus, or shrink the satellite for a lower-cost launch. Electric propulsion can come with trade-offs though, according Mike Glogowski, director of propulsion at Orbital ATK. The biggest trade off is time to orbit; chemical propulsion gets the job done in days while electric takes months. Some operators have elected to pursue hybrid systems to get the best of both worlds, but the added mass of hybrid systems can sometimes negate the benefits of electric propulsion in the first place, Glogowski said. The electric feel shows no signs of wearing off, especially now that satellite manufacturers feel having electric propulsion is a must-have option for their customers. Launch providers too bear witness to this trend. Arianespace’s second-ever Soyuz mission to geostationary transfer orbit, SES-15, was possible because the all-electric satellite weighed just 2,300 kilograms (the first, Hispasat-36-W1, used chemical propellant, but was the first of Europe’s SmallGEO program, which was an all-electric version under way). International Launch Services’ Proton rocket variants target lower-mass satellites, which have become increasingly popular as a way to reduce launch costs. OneWeb’s first-generation mega-constellation of 900 satellites also plans to use electric propulsion. Electric propulsion still has challenges to overcome to gain the next 25 percent of the total commercial market. Costs have come down, but orbit raising times of four to eight months means only operators that can stomach long waits can consider it. Orbital ATK’s Glogowski said one technique manufacturers are considering is higher power electric propulsion, drawing more heavily on a spacecraft’s batteries to shorten the commute to the GEO-arc. Launch providers are also trying to deploy satellites closer to GEO — SES-15 separated from Soyuz about 5,000 kilometers from GEO to cut a month off its orbit raising time.